We are Deb and Jim Crum. We founded Crum's Heirlooms in 2002. Having always had a family garden, we believe in healthy eating and enjoying locally produced food. While working other jobs, we began farming operations on a small scale, growing high-quality heirloom tomatoes in our backyard and selling them at farmers' markets in Kansas and western Missouri. 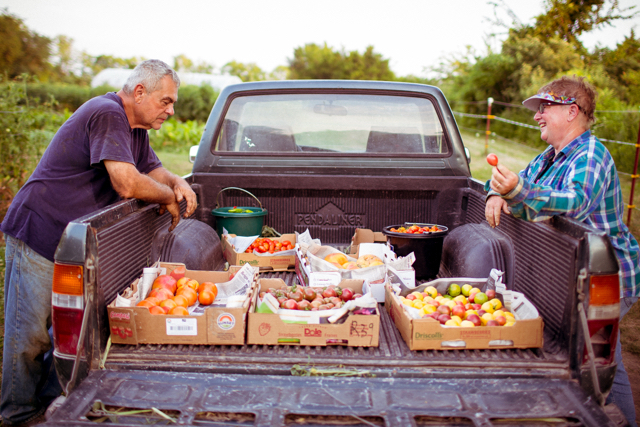 Between 2003 and 2004, we began selling our tomatoes to our first restaurant customer, bluestem, in Kansas City. The business grew rapidly as we began serving additional local restaurants, and we moved operations to our present farm in Bonner Springs, KS. In 2006, we formed a Community Supported Agriculture (CSA) program to sell some of our produce on a membership basis. We now cultivate 10 acres of our own land, plus 2 acres of leased farmland nearby, growing a broad array of vegetables and herbs. In addition, we produce our own homemade products such as salsa and catsup. In partnership with other local growers and providers, we also offer fresh eggs, apples, honey and other healthy produce. All farm and business operations are based on the involvement of the entire Crum family, without whom the farm would not be able to operate on the scale it does. Each family member contributes his or her particular talents to specific activities such as general farm operations, a separate herb growing operation, management of the CSA program, assisting at farmers' markets and restaurant sales. In addition, many friends volunteer throughout the growing season to help plant, grow, and harvest produce.